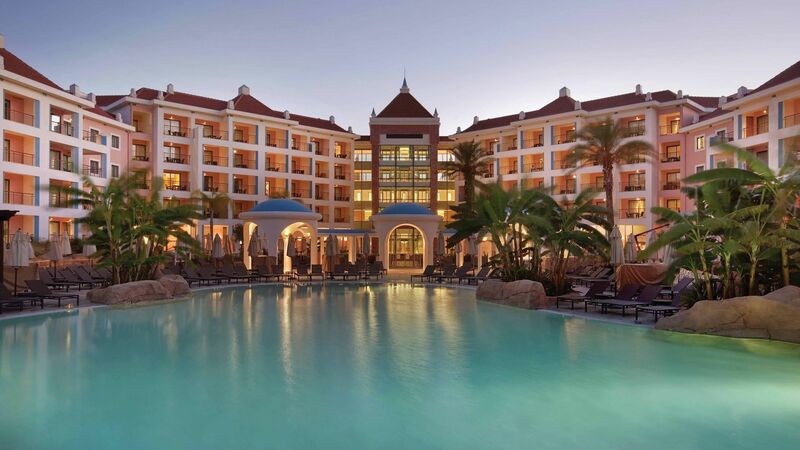 Situated in an abundance of beautiful gardens, Hotel Vilamoura As Cascatas is a luxurious hotel that boasts six large swimming pools accompanied by glorious waterfalls, making it the ideal retreat for a relaxing week in the sun. The hotel’s impressive 7 Seven Spa also offers guests a plethora of indulgent treatments, perfect for a holiday full of pure bliss. Inside the hotel itself, guests can enjoy a wide and varied selection of 176 rooms located across four floors, ensuring every guest has ample space for their individual comfort and luxury. The Paradise Island Kids’ Club is spread out across 3,000 square metres and is free for children between the ages of 4 to 12 years. Parents can enjoy unwinding and relaxing in the fully equipped spa while children enjoy a substantial range of interactive activities in the kids’ club. Hotel child prices apply from ages 0–5 years and 6–12 years. Specially modified rooms for people with reduced mobility are available on request. 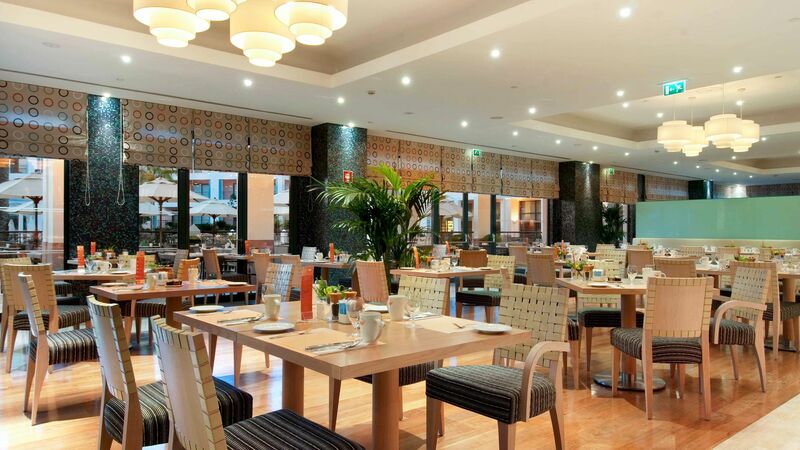 Serving a hearty selection of Portuguese and South American dishes using only the freshest local ingredients, Cilantro is Hilton Vilamoura As Cascatas Golf Resort’s main restaurant and the ideal spot for dinner. 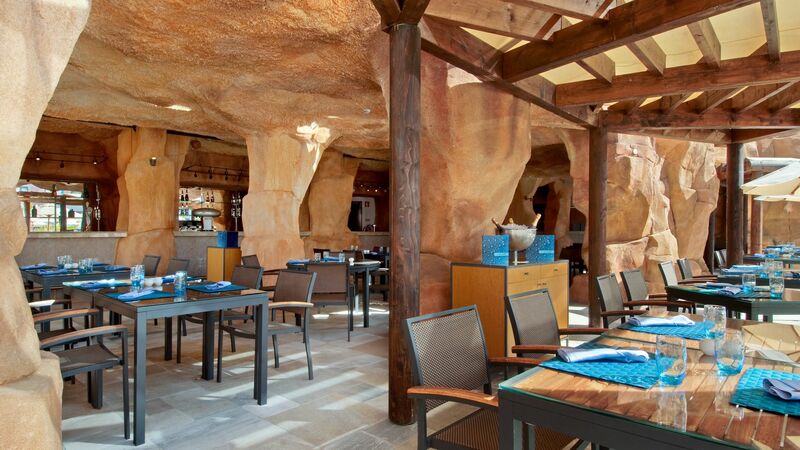 Indulge in some truly amazing Mediterranean barbecue dishes while listening to the serene cascading waterfalls in the background. Choose from a range of freshly prepared dishes, including seafood, salads and fruit smoothies plus a wide selection of scrumptious barbecue food. 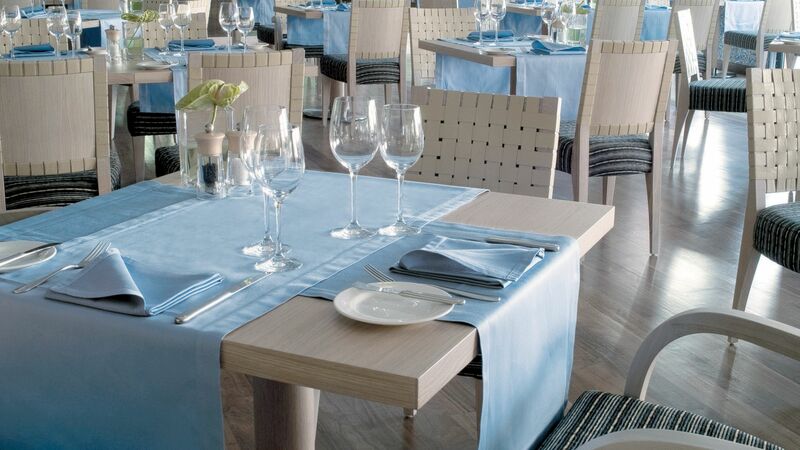 The Moscada restaurant is perfect for dining throughout the day. Start the day right with breakfast on the terrace while admiring the gorgeous views, or descend to the restaurant in the evening for a spot of al fresco dining and tuck into some of the finest buffet food in the area. Meals at this restaurant are included for guests staying on a Half Board orBed & Breakfast basis. Falesia private beach is just a short drive away from the hotel. The complimentary shuttle bus runs throughout the day from May to October. In Falesia you’ll find a gorgeous beach surrounded by cliffs and idyllic sand, ideal for a day of pure relaxation by the sea. The Hilton Vilamoura boasts six impressive swimming pools, including a luxurious indoor heated pool. Guests can benefit from a selection of parasols, sunbeds and towels to use throughout their stay. 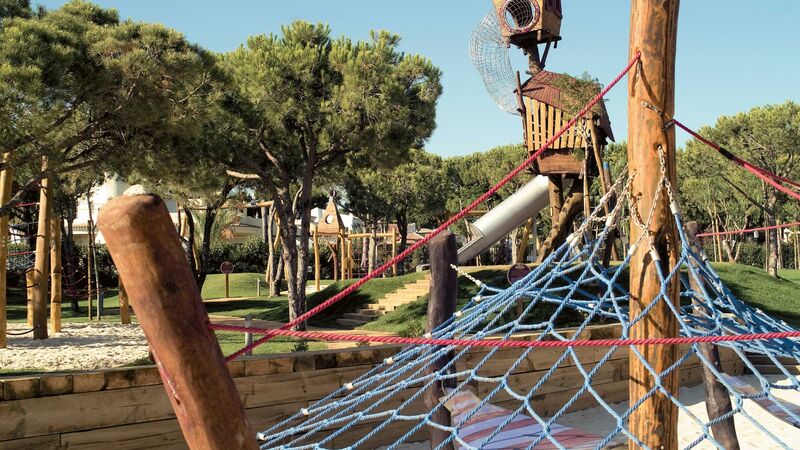 The Kids’ Club at the Hilton Vilamoura is the perfect place for kids to keep active and make new friends during the day and offers incredible entertainment and activities such as themed days, arts and crafts, treasure hunts and much more. For teenagers who prefer to do their own thing, Hilton Vilamoura has the ideal solution in the form of the Teenagers’ Arcade. A range of teen-friendly activities can be enjoyed in the arcade, including pool, mini golf and a video game station – the perfect haven for every teenager. 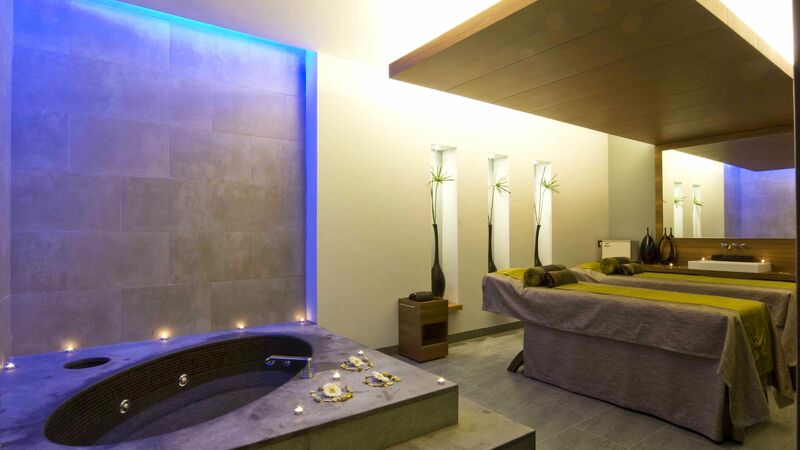 Portugal’s largest spa, known as 7 Seven Spa, resides at the Hilton Vilamoura As Cascatas Golf Resort and offers a wide variety of luxurious treatments as well as a spacious steam room, sauna and whirlpool. The spa, surrounded by the Zen Garden, is available to guests for €20 per person/per day and includes all the facilities including an aroma bath, jacuzzis and a Turkish bath. Guests under 16 years are not permitted in the spa. Two 18-hole golf courses reside near to the hotel and offer stunning landscapes and spectacular views of the surrounding area. Guests can hire golfing equipment from the golf shop and enjoy an afternoon strolling around the impressive courses. 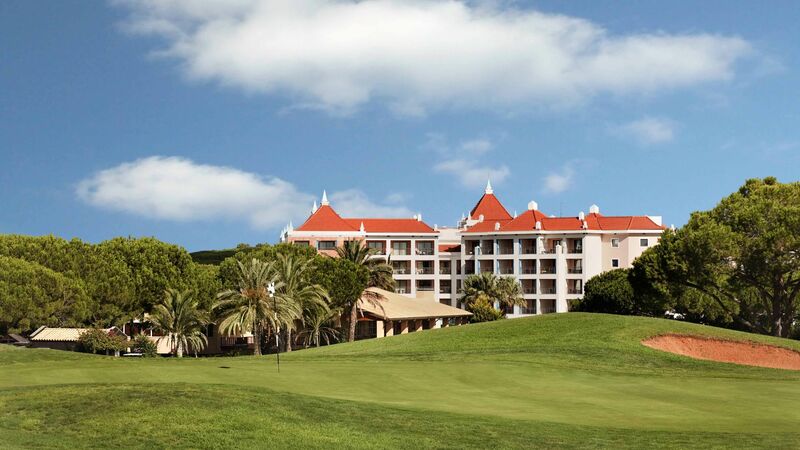 Located in lively Vilamoura, along Portugal’s beautiful Algarve coastline, Hilton Vilamoura As Cascatas Golf Resort and Spa is perfect for those wanting to explore. The hotel is located close to the pretty, colourful houses dotted throughout the centre of the town, as well as one of the many professional standard golf courses in the area. Head into Vilamoura’s lively marina area where you’ll find luxury yachts and boat trips and excursions which leave daily. There are plenty of upmarket restaurants and bars here, serving delicious local favourites including freshly caught seafood washed down with local varieties of wine. If you prefer to hit the beach there are gorgeous golden sands nearby, as well as coves to explore around the coast. 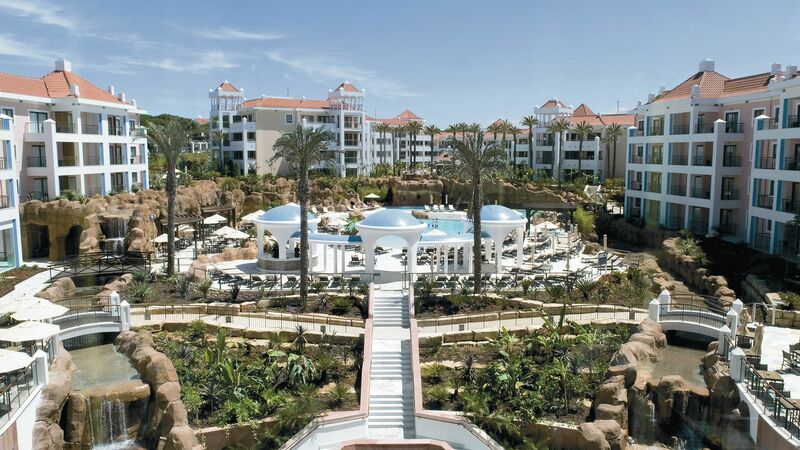 Hilton Vilamoura As Cascatas Golf Resort and Spa is a 30 minute drive from Faro Airport. Deluxe Golf View Rooms feature lush green views of the surrounding golf courses. Deluxe Plus Rooms feature a king-size bed and separate seating area with sofa bed and a balcony. The extra bed type is a sofa bed. Deluxe Pool View Rooms offer stunning views of the pools and gardens. The extra bed type is a roll-away bed. Deluxe Rooms have two twin beds and the extra bed type is a roll-away bed. Family Suites feature a king-size bed or two twin beds, a separate seating area with sofa bed and floor-to-ceiling windows, two bathrooms and two spacious balconies. The extra bed types are a sofa bed and a roll-away bed. Family Suites Pool View offer lovely views over the swimming pool and gardens. Interconnecting rooms consist of two Deluxe Pool View Rooms offer stunning views of the pools and gardens. The extra bed type is a roll-away bed. One Bedroom Apartments Pool View feature a king-size bedroom, separate living room with sofa bed, dining area, kitchenette including a fridge, oven, microwave, dishwasher, washing machine, toaster and kettle, satellite LCD TV (including children's channels), DVD player and a balcony with views over the pools and gardens. The extra bed type is a sofa bed. Two Bedroom Apartments feature one bedroom with king-size bed and second bedroom with twin beds, separate living room and dining area, a fully equipped kitchen and a balcony. The extra bed type is a sofa bed and cots are available on request. Two Bedroom Apartments feature one bedroom with king-size bed and second bedroom with twin beds, separate living room and dining area, a fully equipped kitchen and a balcony. The extra bed type is a sofa bed and cots are available on request. This apartment has views of the surrounding golf courses. Two Bedroom Apartments feature one bedroom with king-size bed and second bedroom with twin beds, separate living room and dining area, a fully equipped kitchen and a balcony. The extra bed type is a sofa bed and cots are available on request. This apartment has views of the swimming pool. Save up to 20% discount on bed and breakfast or half board rates for stays until 31 October 2019 booked by 30 April 2019. Children between the ages of 4 - 12 years have free access to the Paradise Kids Club for holidays between 01 March - 31 October 2019 (Opening times are subject to change). just me and the wife had a lovely stay in march..the weather was beautiful..the room was very good and spotless .an exellent view of the golf course..kept us amused whilest sat on the balcony drinking our tea .very nice swimming pools and gardens .bar area very relaxing for a drink ..free shuttle bus to the marina was very good .we got on the land train one day from the hotel which was a nice tour ..yes we would like to come back again.. The rooms and the pools are lovely. However, the prices in the restaurant are extortionate and the service is not great. They made us wait for a table when the restaurant was nearly empty and no one was smiling or seemed to even want to be there. We found local restaurant within walking distance instead which were lovely. The hotel is surrounded by golf courses which is great if you play golf, otherwise it is over a 30 min walk to the marina or beaches. The shuttle, which only accommodates 20 people, runs every 2 hours taking you to the main town. For such a short distance in the shuttle it would have been helpful if it ran every hour. My husband and I found ourselves taking Uber?? ?s back rather than relying on the hotel shuttle, which shouldn?? ?t be the case. I think the Hilton could step their service up a notch. Two couples on an early spring break. Fantastic location - only 20 mins from airport. Excellent friendly service .Very high spec and beautiful setting.Reliable and regular compimentary courtesy bus to Marina only a few minutes away - large choice of good restaurants/bars and quality shops !!!! !.Husbands played golf and we relaxed by one of several beautiful swimming pools .We will definitely return. Four of us stayed for 4 nights in April. From the moment we arrived we were made to feel very welcome and although we arrived at the hotel around 11am we were able to check in and have our room straight away which was great. the reception staff were very helpful and polite. there's a free shuttle bus a few times a day taking you to the marina which was good to know, but the walk to the marina was only 25/30 mins which wasn't too bad. taxis back from the marina varied from 5-8 euro. we had access to the hotels seven spa so used this daily which was lovely , we booked in for full body massages and facials on our last day which was a really perfect relaxing treat. the staff at the spa were lovely. The breakfast in the hotel was of a huge variety - cooked breakfast eggs sausage bacon etc then cereals fruit yoghurts etc and pancakes French toast etc etc definitely enough choice for everyones palette. we didn't use the pool area really but it looked lovely and clean. we had drinks at the Rubi bar one evening before heading out to willies restaurant (Michelin star 5 min walk from the hotel) drinks were nice and staff again nice and friendly. we ate in the Rubi bar on the last day before heading to the airport , I had the club sandwich which came with fries and a side salad a bit pricey at 17 euro but tasted good and was very filling. my sister had the pizza which looked amazing!! we all enjoyed our food, drinks and service in here. we ate tapas at the marina most nights apart from when we went to willies. there are plenty of bars and restaurants to choose from at the marina. we walked out to a small cafe/bar called sailors corner a couple of times and had drink in there , they played the grand national for us as they has 2 large screens with sky channels etc, the people here are so lovely and the food here was nice too - I would reccommend the hot burger. they had happy hour 10am-7pm (ha ha) so we had a few drinks in here on the way to the marina and tried out their 5 euro tapas dish which was ok for the money chorizo, cheeses,olives and bread.the prices here were very reasonable especially in happy hour hours!!! theres also a spar shop across from this which is the nearest shop to the hotel for any bits and pieces you may require.All in all we had a fabulous girls trip and I would recommend to others without a doubt. I would also return with my husband and kids for a family holiday.